In this tutorial, we will see how to create Spring boot + ActiveMQ example. Spring boot comes with embedded ActiveMQ similar to tomcat, so you don’t have to create external ActiveMQ.If want to configure with external ActiveMQ, you can do it just by change in application.properties file. Here are steps to create Spring Boot + ActiveMQ example. 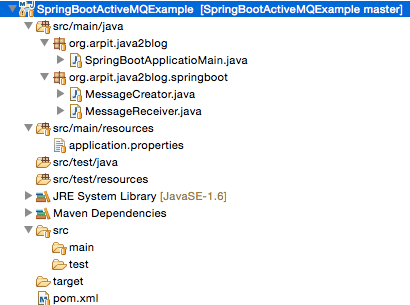 Step 1: Create a simple java project using maven in eclipse named “SpringBootActiveMQExample”. Since we are developing a spring application integrated with activemq, we also need to add spring-boot-starter-activemq dependency. This will include additional dependencies such Spring boot, activemq etc which are required for this application. @JMSListner:This Annotation is actually used to mark a method to be the target of a JMS message listener on the specified destination(). Please note that you just need to provide ActiveMQ broker url, if you specify above property then Spring boot won’t create another in memory embedded ActiveMQ. @EnableJMS annotation is used to trigger search for method annotated with @JMSListener, hence to create JMS listener in the background. That ‘s all about Spring Boot + ActiveMQ example.Please comment you find any issue.